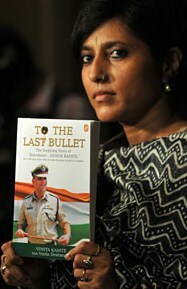 26/11 martyr Ashok Kamte’s widow Vinita has painstakingly chronicled the events leading to her valiant husband’s death in last year’s Mumbai terror attacks, thoroughly conducting her own probe. Her book To The Last Bullet released Wednesday at Mumbai’s Taj Mahal Palace and Tower hotel, which itself was one of the sites of the terror attacks, undoubtedly slams the police and is sure to embarrass the government. Till date, Vinita maintains that her husband Kamte did not get any help for about 40 minutes after being shot by the terrorists. Additional police commissioner Ashok Kamte was killed with two other top officers Hemant Karkare and Vijay Salaskar in the attacks. Vinita, 43, used information from right to information requests, meetings with eyewitnesses, police control room records and post mortem reports. I join Vinita and her two sons in mourning the death of the man who indeed died a hero’s death that night. Oh this is so sad………! But, Vinita Kamte said she stands by every word written in her book. However, she also told the media that she is not singling out any officer for blame with regard to what transpired on Nov. 26-27, 2008, but is only seeking answers and wants to highlight the systemic failure in the police response.